This wouldn't be a geek site if I wasn't keeping track of the latest news on this summer's The Dark Knight, so here's another teaser poster courtesy of AintItCoolNews.com. It's The Joker again, smearing a bloody smile on some frosted glass. 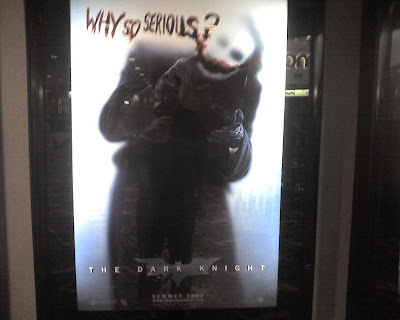 The "Why So Serious?" line seems to be on a lot of the promtional material thus far and showcases one of the reasons why The Joker is so fascinated by Batman. It's impossible to get a chuckle out of a guy who dresses up as a bat.